On Sale Now! 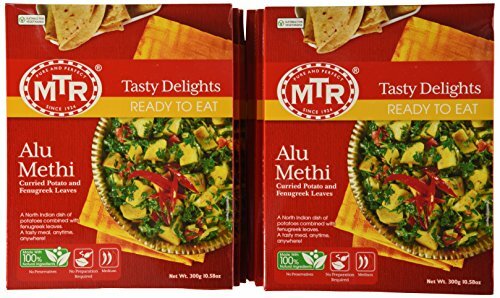 Save 2% on the MTR Alu Methi, 10.58-Ounce Boxes (Pack of 10) by MTR at Smokey Robinson Foods. Hurry! Limited time offer. Offer valid only while supplies last. A succulent and mildly spicy curry dish made with potatoes, combined with fresh, fenugreek (methi) leaves. Enjoy with Indian breads and basmati rice. A succulent and mildly spicy curry dish made with potatoes, combined with fresh, fenugreek (methi) leaves. Enjoy with Indian breads and basmati rice. Ready to eat in minutes. Just heat the foil pouch in boiling water for five minutes, or simply transfer the contents into a bowl and microwave.